Further to the World Anti-Doping Agency’s (WADA’s) communications of 4 June and 19 July 2018 regarding the above-referenced, the Agency wishes to remind you that 14 September 2018 is the deadline for submitting feedback for the second phase of the 2021 World Anti-Doping Code Review Process (2021 Code Review Process); and, unless otherwise noted below, the first phase of the International Standards (Standards) Review Process. 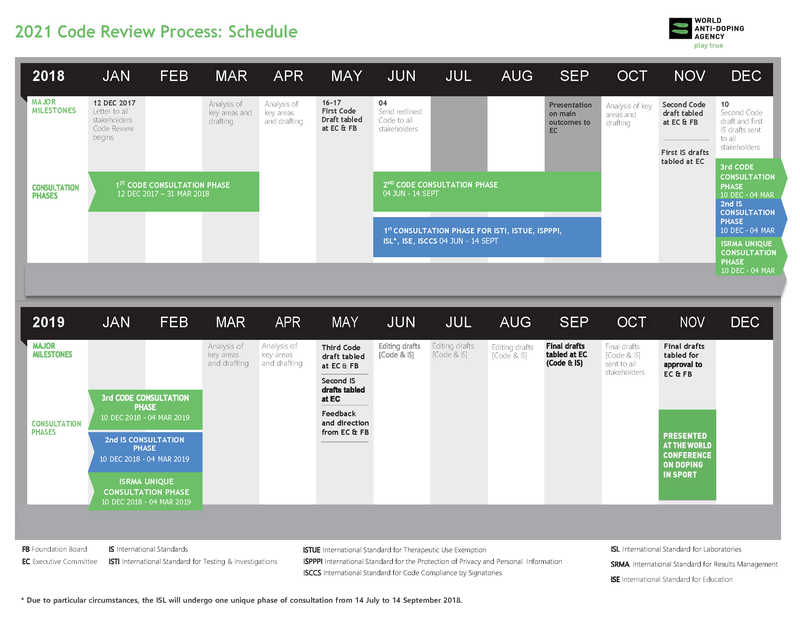 On 12 December 2017, WADA launched the first of the three-phase, 2021 Code Review Process, which also involves review of the Standards. The second review phase is of the draft revised version of the Code that resulted from comments received from stakeholders during the first review phase. Accordingly, we attach the Redline Version of the Code; and, a Summary of Major Proposed Changes. Unless otherwise noted below and in the 2021 Code Review Process: Schedule, the Agency is soliciting stakeholder feedback by 14 September 2018 for the following Standards. 1. The International Standard for Therapeutic Use Exemption (ISTUE). 3. The International Standard for Education (ISE), which is a new Standard that WADA’s Board approved for development in November 2017; and, is available for first stakeholder feedback. 4. The International Standard for Results Management (ISRMA), which is also a new Standard being developed that was presented to WADA’s Executive Committee (ExCo) and Board in May 2018. The first draft of the Standard will be validated by the ExCo in November 2018; and then, be circulated for stakeholder consultation during the third phase of the Code review and the second phase of the Standard review from December 2018 to March 2019. There will only be one consultation phase for this Standard. 5. The International Standard for the Protection of Privacy and Personal Information (ISPPPI), which is the new version adopted by WADA’s ExCo in May 2018 to ensure alignment with the main principles of the European Union’s General Data Protection Regulation that came into force on 25 May. 6. The International Standard for Testing and Investigations (ISTI), which will undergo two full rounds of consultation. The ISTI is also distributed with marked up text to two sections for reasons outlined below. Over the past few years, WADA has received input from stakeholders, particularly Athlete Biological Passport (ABP) experts and Athlete Passport Management Units (APMUs), which proposes changes to Annex L of the ISTI. Following the first round of consultation on the ISTI and consideration of all comments from stakeholders on changes to the above two sections of the ISTI, it will be submitted for approval at WADA’s ExCo meeting in November 2018; which, if approved, would come into effect in early 2019. 7. The International Standard for Laboratories (ISL), which is a particular situation. It should be noted that a revised version of the ISL was already circulated to WADA-accredited laboratories for comment; and that, a second version was circulated to all stakeholders on 13 July with an opportunity to comment until 14 September. This particular review of the ISL was triggered by some urgent changes that could not reasonably wait until 2021. It is foreseen that a revised version (10.0) of the ISL will come into force in 2019. The ISL may then undergo further revision in 2020 to bring it in line with the 2021 Code. The International Standard for the Prohibited List is not part of this review process as it is reviewed annually via a separate stakeholder consultation. As indicated above, unless otherwise indicated, for this phase, we would ask you to propose recommendations no later than 14 September 2018 via WADAConnect, the Agency’s online consultation platform. Easy to use, WADAConnect will prompt you to create a user account and input your comments regarding aspects of the Code and/or Standards that are of particular interest to you. For more information related to WADAConnect, please refer to the simple user guide. We look forward to receiving feedback. The high quality of stakeholder feedback that was collected during the 2009 and 2015 Code Review Processes was instrumental to ensuring that the Code be strengthened over time in protection of clean sport.